ড. বদিউল আলম মজুমদারের ওয়েবসাইট: Who is misleading whom? The EC has been under fire after two phases of UP elections were marred by widespread irregularities and violence. Media published numerous reports, and TV talk-shows held many discussions questioning the capability, neutrality and effectiveness of the Commission. Some of the partners of the ruling party were also very critical of the EC. In the face of such criticism, the Director of Public Relations of the EC recently issued a press release, in which he claimed that the news media and TV talk-shows have been spreading misleading information about the Commission. The press release claimed that the irregularities were few and represented only isolated incidents. For instance, in the first phase, the elections of only 65 or 0.94 percent of the 6,780 centres and in the second phase, only 37 or 0.50 percent of the 6,880 centres were suspended. These statistics were used as evidence to claim that the elections were free and fair. It is clear from the above statement that the commissioners are not clear about what constitutes a fair election. They should know that election is a process; it is not a one-day – only Election Day – affair. If they do not know that free and fair elections depend on what happens over a longer period of time, it represents a gross manifestation of their lack of knowledge. Incidentally, the issues of widespread violence and dozens of deaths were ignored in the press release. Several yardsticks are used to determine whether an election is free, fair and acceptable: (1) whether the electoral roll used was inclusive, accurate, based on adult franchise and everyone eligible were enrolled; (2) those who wanted to be candidates could become candidates; (3) there were alternatives before the voters and the elections were competitive; (4) voters could safely go to the voting centres and freely cast their votes; and (5) the whole process was transparent and credible. Based on these criteria, the first two phases of the UP elections cannot be considered as free, fair and acceptable. 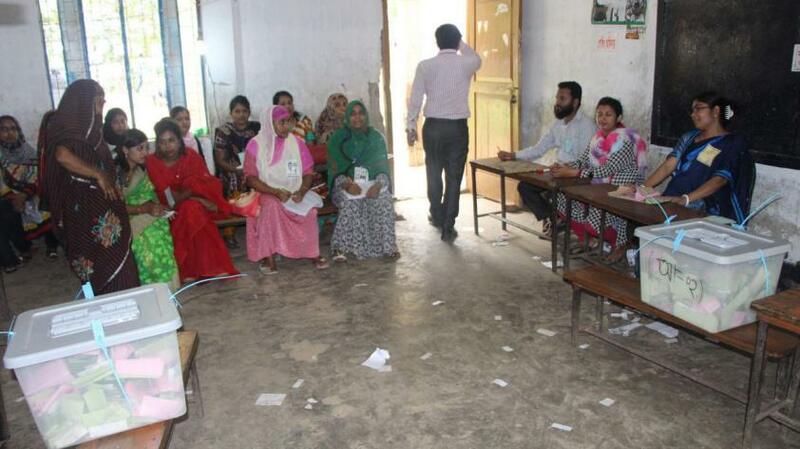 In many upazilas, candidates from opposition parties, even those who belonged to collaborating parties of the ruling alliance, were prevented from submitting their nomination papers. Many of those who wanted to file nomination papers could not, because of cases, threats and other forms of intimidation while carrying out their election campaigns. As a result, BNP could not field candidates in 162 Unions and 87 chairmen candidates were elected unopposed in the first two phases, which clearly indicates that the elections were not competitive. Because of violence, fake voting, stamping and ballot box stuffing, many voters around the country could not cast their votes. The EC's unwillingness to take into cognizance the complaints of irregularities, its claim that elections were free and fair despite widespread irregularities, and other controversial actions by the Commission have raised serious questions about the transparency and credibility of the entire electoral exercise. The present EC also appears to have compromised the integrity of our electoral roll, which represented one of our major achievements. It may be recalled that the electoral roll created during 2007-08, with the help of our armed forces, represented the most accurate roll. In that roll, there were over 14 lakh more women than male voters. A reason behind this could be the fact that despite the equality of proportion of men and women in our population, nearly one crore Bangladeshis work abroad, almost all of whom are male and many of whom are not voters. Even though it is normal for more women to be in our electoral roll than men, nearly 47 lakh new voters were added to the roll in 2014, the gender-gap was 12 percent, that is, women voters were 12 percent less than their male counterparts. Similarly, the gender-gap was over 5 percent when nearly 44 lakh voters were added during the updating process of the electoral roll in 2015. It is thus clear that in the updating process, women were under-enrolled in the electoral roll, which raises serious questions about the accuracy of the electoral roll used in the current elections. It is also clear that the downward trend in the quality of our elections, which started from the general elections of January 4, 2014 under the present Commission, continued through the two phases of the UP elections. In addition, we witnessed a few unique trends in the present UP elections which were absent in the past. For example, the so-called 'nomination trade' spread to the grassroots, which corrupted both upazilas and our electoral system, and caused widespread de-politicisation. Furthermore, not only have we witnessed widespread violence and dozens of deaths, these took place over a longer period of time and were within the ruling party, which never happened before. We also saw for the first time, candidates from the opposition, even from the partners of the ruling parties, were prevented from filing their nomination papers or campaigning freely. All of these excesses and electoral offences were carried out openly, blatantly and without any hesitation. As a result, it is now increasingly being realised that free and fair elections, even UP elections, cannot be held under a politicised bureaucracy and law-enforcement agencies. Incidentally, an argument can be made that the EC not only misled the people about the fairness of elections, it has also been breaking the electoral laws and rules. For example, even though the Voter Talika Ain, 2009 requires the electoral roll to be updated in January every year, the present EC started this task in May 2014 and July 2015. In addition, although the law requires the enumerators to go from door-to-door to update the electoral roll, they did not, as a result of which women were under-enrolled. Furthermore, despite the legal compulsion to update the electoral roll every year, in 2015, the EC collected information of 15-17-year-olds in order to avoid sending the enumerators to every household every year, which is a clear violation of the law. Even though the law requires the EC to publish electoral rolls on the website, the EC does not do so. How can one interpret such behaviour of the EC but as a breaking of the electoral law of the land?